Last week, we heard that the Lenovo K800, one of the first Intel-based smartphones that we know of, was slated to be released next month, but now it seems that it may be coming quite a bit earlier, like within the next few days. 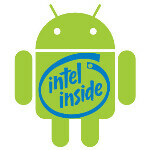 Okay, it may not be the Lenovo K800, but something with Intel inside is coming. During the Q1 earnings call for Intel, CEO Paul Otellini revealed that the first Intel-based smartphone would be shipping by the end of the week. He didn't say which phone it would be, but the first three that are expected are the Lenovo K800, the Orange Santa Clara or the Lava Xolo X900, so it must be one of those that's on its way. All three of the devices are powered by the 1.6GHz Medfield Atom Z2460 processor. All three have relatively respectable specs otherwise with the Lenovo being the best coming shipped with Android 4.0 and a 4.5" 720p screen, and the other two will be running Android 2.3 with 4" 1024x600 screens. Should be interesting to see which will be the first out of the gate, and where we may see it land. This should make things interesting in the phone game. Nothing like some new blood for the Exynos fans to crap on!